Tim McCreery President and CEO of WildPackets presented the company history to the Wireless Field Day 5 delegates. Wildpackets was founded in 1990, and now their customer base spans 60+ countries and over 7,000 customers. Jay Botelho Director of Product Management spoke next, and gave us the WildPackets technical history. Since the last time WildPackets presented at WFD4, they've since brought to market full 802.11ac support and data captures from locally-attached or remote access points. The demonstration of the 802.11ac capture was interesting in that copies of OmniPeek and 802.11ac adapters were gifted to the delegates in order for them to generate 802.11ac traffic in the presentation room. OmniPeek only has drivers for the Ralink chipset wireless adapters at this time, but they should have a two stream adapter supported by the end of this year. Per Jay Botelho, trusting RSSI reporting from access points is iffy since vendors apply RSSI values differently. WildPackets does some analysis work on the capture that is RSSI, and they have to do some work to convert that to dBi or a percentage value. Using multiple adapters to capture data is key in analyzing client roaming in any wireless network. When Jay listed the channels his test network was configured for (2, 6 and 10) I was concerned, since these are not non-overlapping channels. I do not know if this was just for testing purposes that these channels were used, but it isn't an optimal configuration. WildPackets is currently running a special discount on their Mobile WLAN Analyzer bundle. The bundle includes OmniPeek Professional and 3 OmniWiFi USB WLAN (802.11a/b/g/n) adapters. The $900 discount is only good through 10/31/2013. 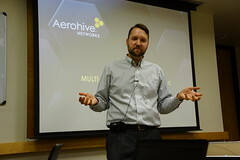 The thing I always vividly remember from an Aerohive session at Wireless Field Day, is the presentation by Matthew Gast. I love how he intertwines fun facts and figures into a slide deck AND uses matrix math to explain things that are still (somewhat) theoretical in nature. At the WFD5 event, Matthew Gast presented on MU-MIMO in 802.11ac. I tried to take notes, but the information flow was more than my brain buffer can process in real-time. Multiple devices connected at the 64 QAM rates will be able to send/receive more data than a single 256 QAM device will tx/rx. The feedback loop based on speeds now is "Did you get an ACK or not? ", it's not a matrix describing the connectivity. You can mix data rates inside a feedback matrix data result. The block ack protocol is used when transmitting to multiple devices at the same time. This is a layer on top of sending beamformed frames. Data rates within a beamformed frame can be mixed. Block ACKs get used as a distributed acknowledgment system along with the RTS-CTS mechanism. Multi-user MIMO is trading total overall throughput for individual peak throughput, and only works downstream. The GCMP encryption requires AES but has fewer trips through the AES block and is still only optional in 802.11ac. I know all of that is quite a mouthful of acronyms! If you haven't watched the Aerohive presentation series, you'd be doing yourself a favor if you did. Aerohive ID Manager Demonstration at WFD5 from Stephen Foskett on Vimeo. Aerohive Client Management Demonstration from Stephen Foskett on Vimeo. Aerohive Application Visibility and Control Demonstration from Stephen Foskett on Vimeo. Aerohive Application Visibility and Control Presentation at WFD5 from Stephen Foskett on Vimeo.